MUSKEGON, MI — Despite having to work all week, Christine Morse made it her mission to attend the Unity Christian Music Festival each day. On the fourth and most crowded day, Morse was thankful to be part of the experience. Since Day Zero on Wednesday, Morse said she has been driving back and forth from her job in Norton Shores. Amid the hectic week, the 14-year-old festival has served as a music getaway for her and thousands of others. 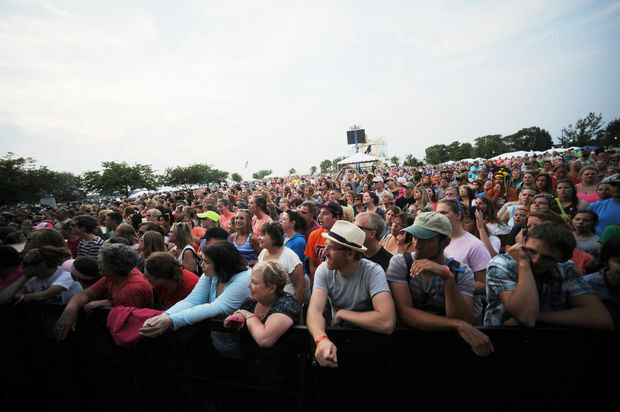 The crowd in itself on Saturday had multiplied since the festival’s opening day, expanding even further out to the borders of Heritage Landing. Decorative wristbands covered the wrists and forearms of fans that chanted and sang along to their favorite songs. Some took naps in between performances, while others sought shelter under their umbrellas. The most dedicated of fans gathered around the stage and clapped their hands ceremoniously to the beat of the music. The stage itself extended out into the crowd as several of the musicians took the opportunity to perform in the middle of their fans. Children’s activities located across the bridge on the other side of the water at Heritage Landing were being put to good use. Some had the opportunity to shoot arrows from a bow, while others tested their slap shot at the Muskegon Lumberjacks’ station. One of the main attractions was the two-sided rock wall that had participants of all ages willing to give it a try. A photo booth and a blow-up obstacle course were featured at various stations. Cameron Nicholas took full advantage of the photo booth by wearing one of the spotted dresses for the rest of the Saturday performances. As a first-time festival-goer, Nicholas didn’t know what to expect. However, by the end of the fourth day, the Fremont resident was able to go on stage and meet a few of the artists. Festival Director Kevin Newton said there have been a lot of first-timers at Unity, as the festival has grown considerably over the years. After witnessing the festival’s crowd on Saturday, Newton said Unity had surpassed the 65,000 mark for spectators this year. This year the festival added new high-definition video screens, which allowed spectators way in the back to see what was happening on the stage. The festival, which was founded to bring people and their families together for Christian entertainment, has grown considerably over the years. Morse has been coming to Muskegon for the music festival for the last 10 years. MUSKEGON, MI — Many Muskegon residents are unaware of the resources and services in regards to health that are available to them. 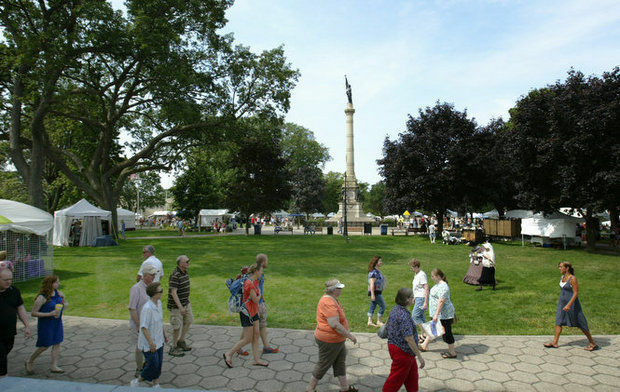 That’s why Muskegon Community Mental Health among other partners will be holding a Health, Wellness and Recovery community picnic on Thursday, Aug. 14, from noon to 3 p.m. at Hackley Park. CMH Customer Service Specialist Lauren Meldrum said the main reason for the event is to provide a learning environment for residents as well as the opportunity to enjoy free food in good conditions. Residents can be administered HIV tests and other screens, while children can come for the activities that will include face painting, balloon animals and other games. This is the second year Hackley Park will be host to the health-raising event, as in the past there was a picnic that used to be garnered toward clients for CMH, before it branched out to the public. Last year an estimated 1,200 people came out to learn more about the community and all it has to offer. Among those supporting Muskegon Community Mental Health in this endeavor are Harbor Hospice, Mercy Health, several local gyms and non-profit agencies. As part of the picnic and other giveaways, sandwiches will be provided by Fatty Lumpkins Sandwich Shack. Apples, pretzels and water will also be on hand. Recovery speakers, who are people who have lived with mental illness or substance abuse and are in recovery, will be in attendance to share their stories in the hopes of reaching those who are struggling. The band that is scheduled to play is Mind, Body & Soul, which is made up of staff members from CMH and their friends who come together specifically for this event.